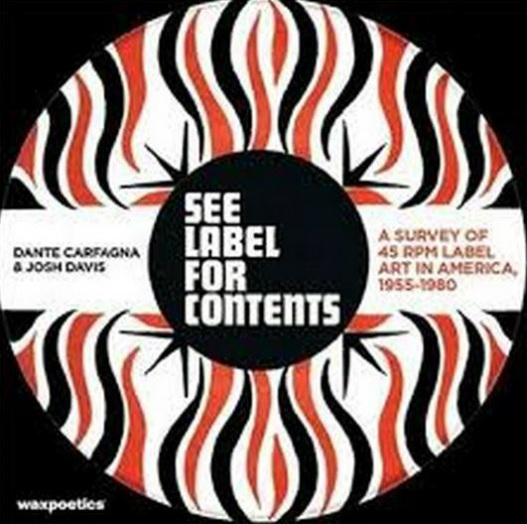 See Label For Contents: A Survey of 45 RPM Label Art in America 1955–1980 presents a colorful tapestry of rare and unique 45 RPM record labels selected by Wax Poetics contributing editor Dante Carfagna and the internationally renowned producer Josh Davis (a.k.a. DJ Shadow). The 45 RPM record is arguably the most plebeian of all recording formats. Between 1964 and 1984, a virtually endless array of records was created nationwide. Since most 45s were not issued with any kind of jacket to display artwork, the record label itself became the canvas on which the creators attempted to lure potential listeners. See Label For Contents surveys the art of the 45 RPM record label in the U.S., choosing to highlight the arcane, imaginative, befuddling, and often hilarious graphics found on the thousands of locally produced records released during the format’s heyday. Themed chapters include Civic Pride, Animals, Space, Horror, Egregious Typos, Native Americans, Proto-Graffiti, Fauna, and Transportation. Josh Davis, a.k.a. DJ Shadow, is a California native who pioneered sample-based instrumental hip-hop in the mid- 90s. He is one of the most authoritative tastemakers in the field, having produced several noteworthy albums (including 1996’s critically acclaimedEndtroducing…) as both a producer and a DJ. A musical revivalist, Davis has reissued several incredible recordings that would have otherwise gone virtually undiscovered.